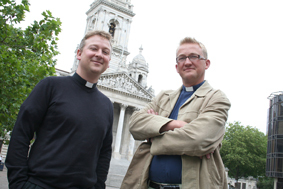 THE Church of England is to explore new ways for people to engage with God in the centre of Portsmouth. The Anglican Bishop of Portsmouth, the Rt Rev Kenneth Stevenson, has appointed his first ‘pioneer minister’ with a brief to dream up new ways of creating church communities in the city centre. Pioneer ministers are a new brand of clergy backed by the Archbishop of Canterbury, whose job it is to find new ways of worshipping specifically designed to appeal to those who are unlikely to come to mainstream church services. The Rev Mark Rodel, who was curate at St Jude’s Church, Southsea, has become ‘city centre pioneer minister’ as well as associate priest at St Luke’s Church in Portsmouth. His job may include finding new ways for people living, working, studying, shopping or partying in the city centre to develop their spirituality. He’s working with the Rev Alex Hughes, formerly chaplain to the Bishop of Portsmouth, who is now priest-in-charge of both St Luke’s and St Peter’s Churches in Somers Town. Alex will support Mark’s work in developing new ways of worshipping. They were licensed together at St Peter’s Church by the bishop on October 2. Mark was one of a team at St Jude’s Church to develop Friday Fridge, an innovative late-night drop-in that includes a café offering free coffee and bacon sandwiches, as well as multi-media prayer installations. Revellers returning from pubs and clubs can write down prayers, light candles and talk about faith. It started two years ago and happens each Friday apart from the final Friday of the month. As well as leading the St Luke’s congregation, Mark will examine how Christians already reach out to those in the city centre before deciding what new initiatives to start. Already, teams of Christians act as Street Pastors, helping those who visit pubs and clubs in Guildhall Walk and elsewhere; chaplains help those working in the council offices and city centre shops; and there are ministers to help university students and pupils at St Luke’s School. Bishop Kenneth said: “It’s important that we offer people a variety of ways to engage with God, including both the traditional parish model and more innovative models that give people the chance to worship at the workplace, as they are shopping, or when they are in the pub. The appointment reflects the wish of the Archbishop of Canterbury, Dr Rowan Williams, to have a ‘mixed economy’ of churches – both traditional parish worship and so-called ‘Fresh Expressions of Church’ – working side-by-side in future. There are now around 170 pioneer ministers working across the country.